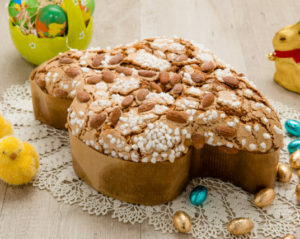 The Easter Dove (in italian la Colomba di Pasqua) is a cake from Italy and traditionally served at Easter. Here’s the recipe! Dissolve the yeast in a little warm water and slowly work in half of the flour; allow the dough to rise in a warm place in a floured bowl. When the dough has doubled in size, place it in a larger bowl and add the remaining flour, beaten eggs, melted butter, sugar and salt. Work the dough gently until it stops sticking to the sides of the bowl, cover with a cloth and allow to rise for another hour. Sprinkle flour on the raisins and the candied peel then shake excess flour away in a sieve. Add the raisins and candied peel to the dough, place in a dove-shaped mould and decorate with almonds, baste with beaten egg and sprinkle with sugar crystals. Cook in a moderate oven for 20-25 minutes. If you want to learn this and many other recipes of our cuisine, remember that the Galilei Institute offers Italian cooking courses in Florence, all year round! !